And while I've been on the topic of updates, I'm sure some of you are wondering what's happened to my quilt. I am still working on it, bit by bit. I think at last update (in August!) I'd done just 4 blocks. 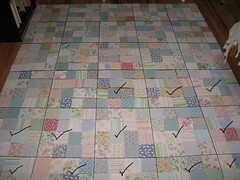 Well every now and then I get a few squares sewn and I've now done 13 blocks (see exciting checkmarks in the photo!). More updated pictures to come when there's something to show you! May everyone have a jolly and healthy New Year!